This leek quiche recipe is one that has been handed from person to person and handed to us from my grandmother. Sharing recipes between friends is a great way to try something you know is going to taste great. A quiche is savoury round open topped pie. 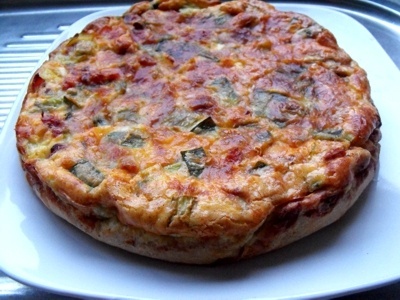 The word 'quiche' also somehow translates into 'cake', which is sort of what it looks like, a savoury cake. This classic dish can be served warm as a side dish or enjoyed as a snack throughout the day. Cold quiches are great for picnics or lunch boxes too. Grease and line a spring form with the base of your choice set aside to rest. Take off the roots and slit the leek lengthwise, wash the leek leaves thoroughly and cut into thin slices. Cut the bacon in dices and fry in a pan with the heated butter. When done take the bacon out and place on a paper towel to drip off excess fat. Fry the leek in the remaining fat for 5 to 10 minutes. Season the leek with pepper, nutmeg and salt. When ready stir the bacon back in. Crack the eggs in a separate bowl, add the cream and whisk. Season with pepper, nutmeg, salt and add the Gruyere cheese. Now fill the cooled base evenly with the leek and bacon topping and pour the egg-cheese sauce over the top. Place the form into the to 200C° preheated oven for 40 to 45 minutes. Convert! Skip to... leave your comments about the leek quiche.